I am so excited about spring this year. I have so many plans for my garden. I can’t wait to begin growing my own vegetables, herbs and fruits and that’s not even counting my flower garden. One thing that I do plan to do differently this year is mark my plants. I mean, when they are seedlings, I always mark them somehow so that I know which ones go where when I transplant them into the garden, but I have never really marked my garden with plant markers. This year I will and I have a great list of 25 DIY garden markers that will help you to mark your plants, too. Garden markers are great, not only for helping you to know which plants are which, but they also add a decorative look to your garden. There is absolutely no rule that says you can’t dress up your garden and these DIY garden markers will help you to do that. The best part is that many of these are made from recycled materials so they may not cost you anything to make. 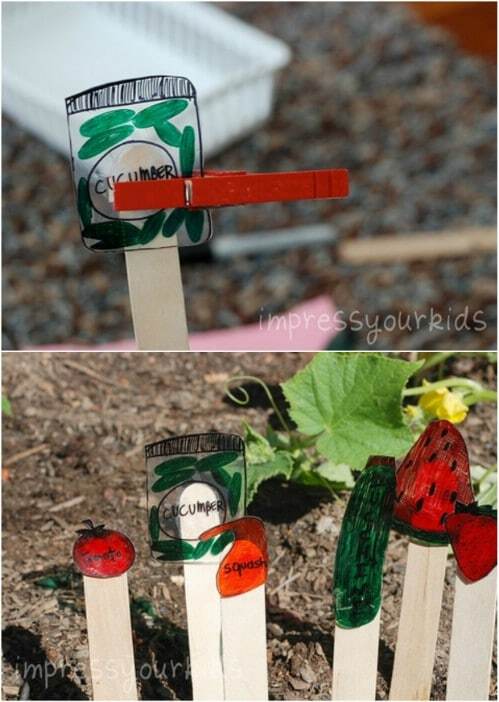 And all of them are super easy and you have so many options so you can customize your garden markers however you want. You should also check out these 20 DIY trellis ideas to add even more beauty and functionality to your garden. 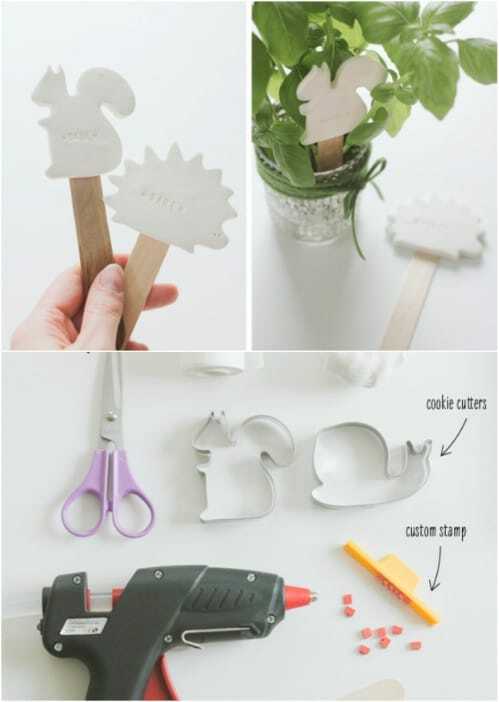 I hope you are excited about planting your garden this year and I hope that these DIY garden markers will help you to keep your plants organized and your garden beautiful. Whether you want these for your herb or vegetable garden, they are really going to help you to stay organized and keep those plants separated. And, you should really take a look at these 25 DIY garden stepping stones. Use them to dress up your flower garden and add beautiful plant markers, too for a garden that is unlike anything else in your neighborhood. Aluminum duct tape is really easy to find at your local hardware store – note that you need aluminum duct tape and not just regular silver duct tape. 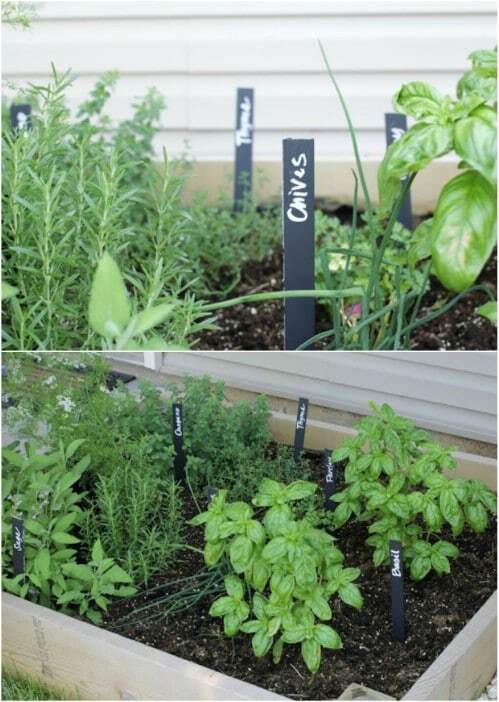 You can use that to create these beautiful garden markers that look like they are stamped with the names of your veggies or herbs. This is a really easy project and you can make as many garden markers as you need for about $5, as opposed to buying stamped metal markers for about $5 each. 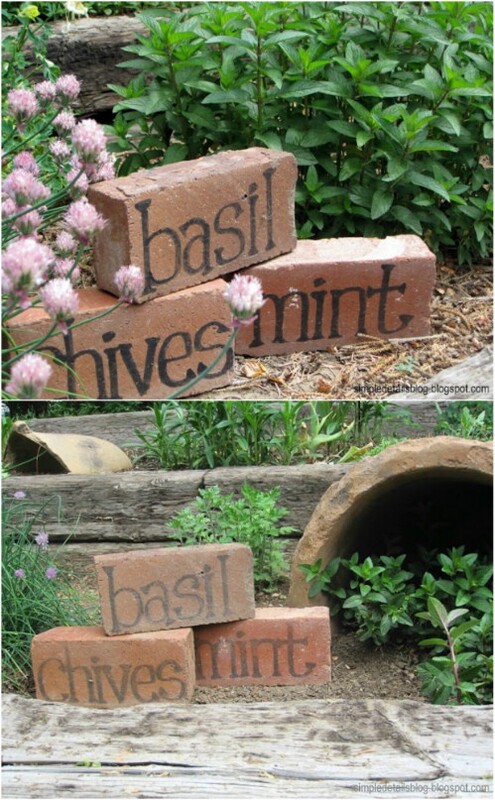 Take that stack of old bricks that you have in the backyard and turn them into these adorable garden markers. These are great for herb or veggie gardens or you could even use them in your flower garden if you want to distinguish between all of your lovely blooms. This project is super easy and if you have the bricks on hand, it won’t cost you anything. There are some really creative ways to reuse old bricks. If you’re like me, you have at least one – or 10 – broken terra cotta planters that you just can’t throw out. 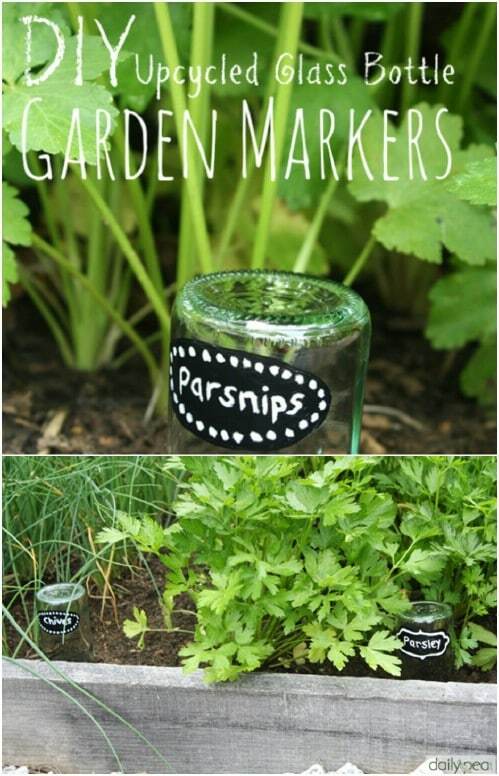 If you do, then you can turn those broken planters into lovely markers for your herb garden. If you don’t have a broken pot to use, you could actually break one. Terra cotta pots are pretty inexpensive at the Dollar Store so it’s justifiable to break them to make these adorable plant markers. Canning season is over for a bit, which means that you can upcycle those old canning jar lids and turn them into gorgeous hand painted garden markers. 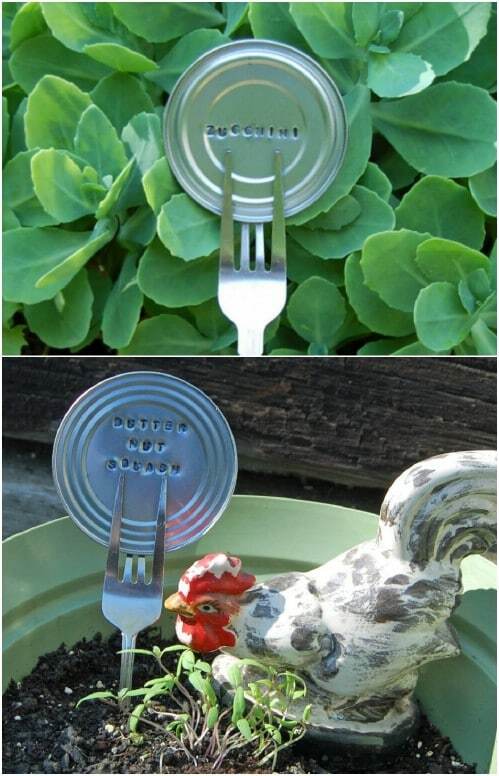 This is a great idea for those of you who do your own canning and have a few used lids that you need to upcycle. You can’t use lids more than once for canning, so this is a great project to make them useful once again. If you want something really easy, these chalkboard paint stick markers are it. You can pick up paint stirrers at any home improvement store. They normally give you three or four when you buy paint. If you happen to have a few on hand, then you’re halfway there. Using chalkboard paint allows you to change the names of your plants as needed and these are just really adorable markers for seedlings, veggie gardens or herbs. 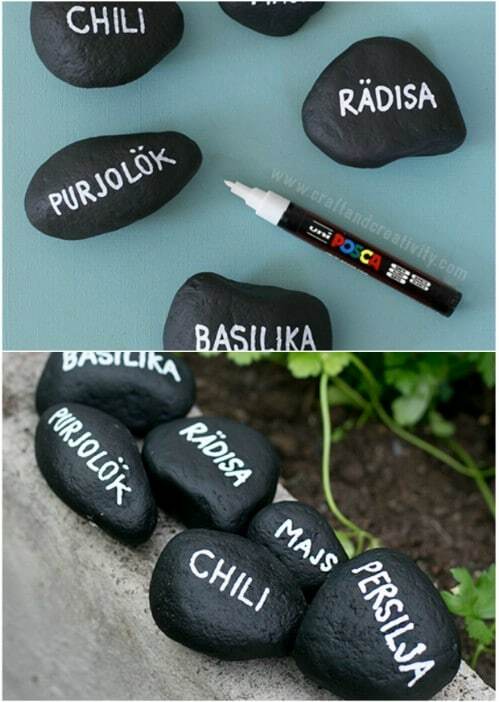 You can also use chalkboard paint to create these amazing pebble or stone markers. I love chalkboard paint projects! This one is super easy and if you have the paint on hand and a few rocks in your yard, this one also won’t cost you anything. You can use larger gravel pieces for herb gardens or grab some river rock for larger veggie garden markers. You have to love creative chalkboard paint projects. Clothespins are so cheap. You can get a bag of 50 or more at the Dollar Store for just a couple of dollars and then you can use them to create your own DIY garden markers. This project is so simple and you can customize your markers by adding any number of colors or designs. 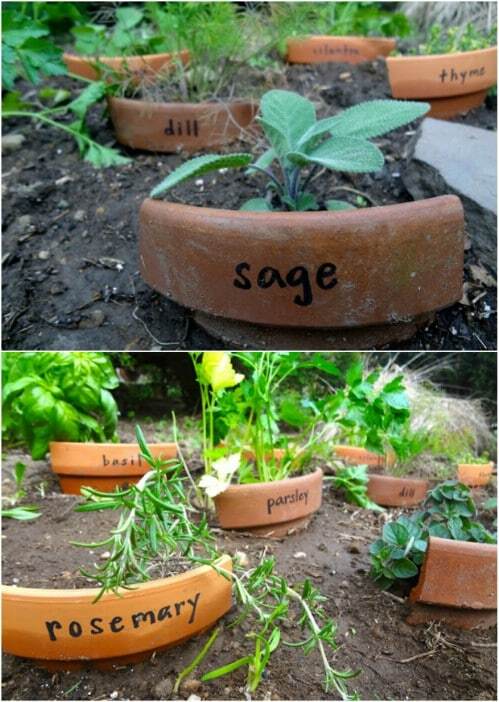 I love this idea for veggie gardens or for herb gardens. You can also use these for your seedling starters. You can make just about anything from clay and most clay projects are pretty easy. These DIY stamped clay garden markers are certainly simple enough and you get to customize the design because you use cookie cutters to cut out your clay shapes. You could even skip the cookie cutters and just form them into little squares or circles. Then, you stamp the names of your plants and you can even paint them if you like. If you have kids, then you have most likely heard of…if not used…Shrinky Dinks. Did you know that you can make them yourself? 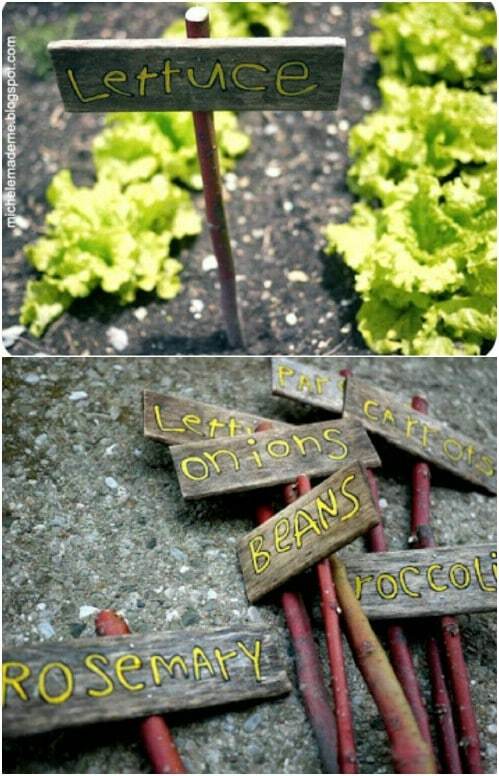 You can – and they are great for using as garden markers for your seedlings or your herb or veggie garden. Homemade Shrinky Dinks are made from recyclable plastic, like the lids from takeout and store bought cakes. So, this is a DIY garden marker and an upcycle project, as well. You know those tin cans that you get veggies and other foods from? 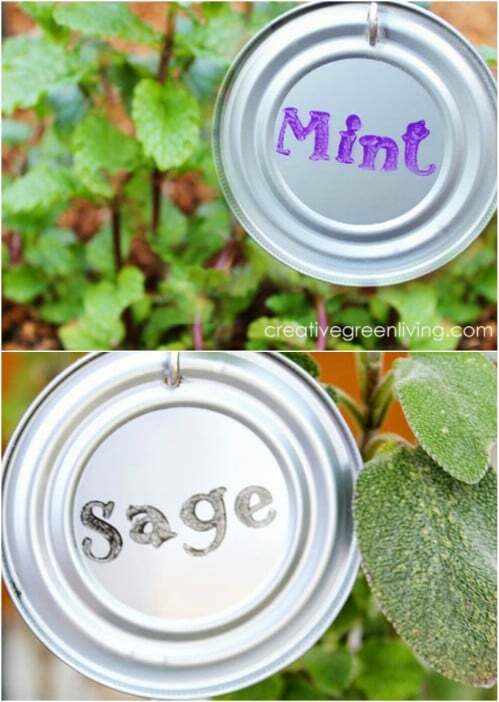 You can use the lids of those cans to create stamped garden markers. This is a great way to recycle those lids – and there are some wonderful recycling projects for tins cans, as well. You do have to make sure to cut away the entire lid – one of those can openers that removes the lid from the sides without any metal shards is a great idea for this project. There are some wonderful ways to upcycle tin cans and their lids! 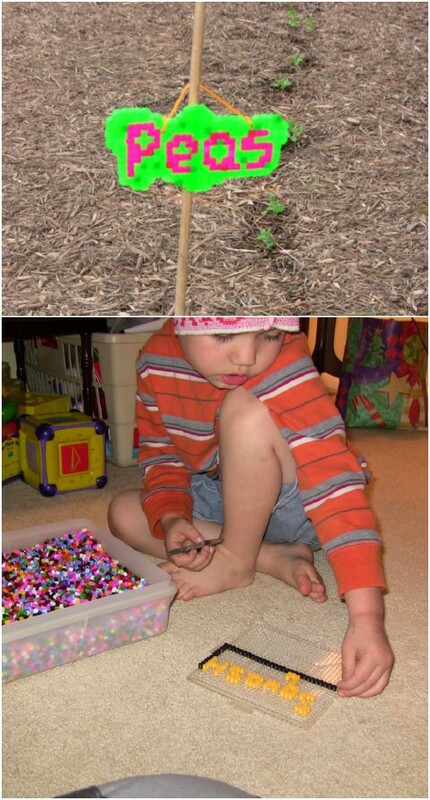 Fuse beads are a fun craft and you can use that craft to make your own fuse bead plant markers for the garden. This is a wonderful project for the kids to help you with. They will have a blast creating garden markers and you will have all of the markers that you need without spending a small fortune. You can get fuse beads at any hobby or craft store, or Walmart has them pretty cheap. If you tend to buy frozen orange juice – or any other type of frozen juice for that matter – you can turn the lids into the most gorgeous plant markers with a little bling. If you don’t have enough lids – use both ends of your frozen juice containers – check with friends and family. You will need one end for each marker and then some random jewelry making supplies. These are gorgeous in herb or flower gardens. These little wooden garden markers are made from an old upcycled door trim, although you could use just about any old wood that you have laying around. If you have boards left over from other projects or old cabinets or doors that you are looking to put to good use again, you can use those, as well. 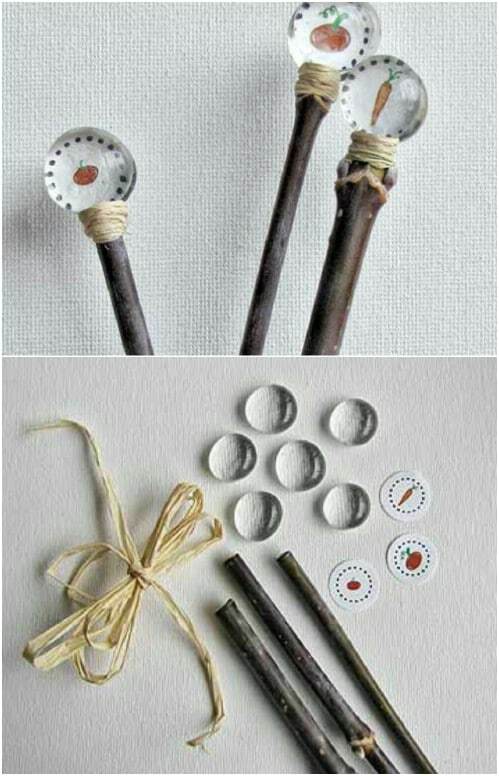 I love how rustic this looks and how easy it is to create these gorgeous wooden plant markers. 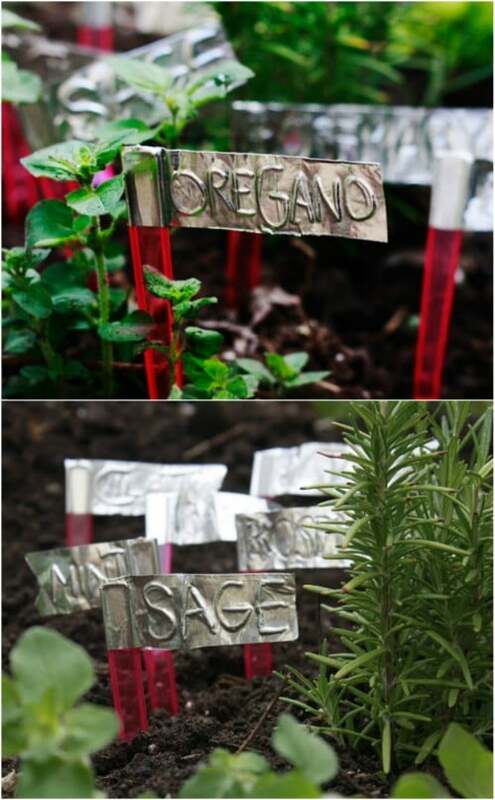 I really love this idea of using old silver spoons to create custom plant markers. You can buy old spoons at thrift stores for about a quarter each – if you don’t have a few that you can use, that is. Once you have enough spoons on hand, you just create your markers with paint or by using Mod Podge and old magazines and stick them right into the ground or in your pots. If you have boys then you probably have an entire bag of marbles. My boys loved marbles when they were younger, so I always had several on hand. If you do have marbles, you can use them to make these gorgeous DIY garden markers and you don’t need anything aside from the marbles, some sticks from your yard and your printer. If you don’t have marbles on hand, you can buy them at the Dollar Store for just a dollar or so per bag. You can buy these adorable little rock garden markers at any store that sells garden supplies, but they are not cheap. Plus, you never know if they have the actual plant marker that you need. An easier way is to just make them yourself. This is so simple and it saves you a bundle over buying those rock markers already done. 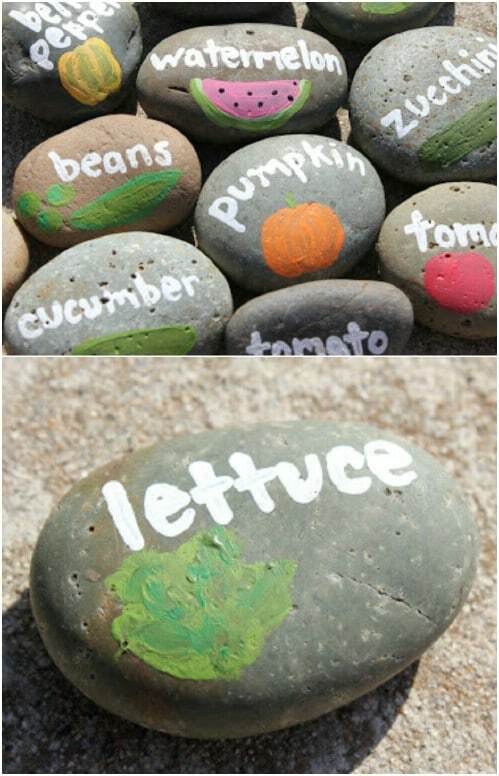 You can make some amazing things with DIY rock and pebble crafts. 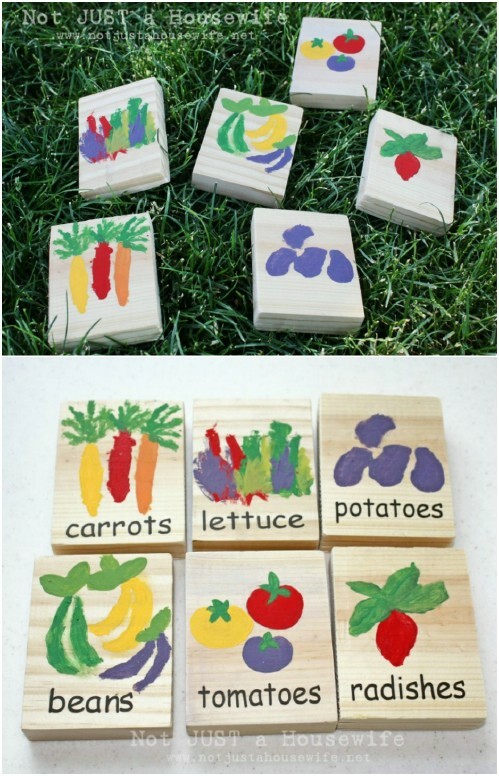 Kids and adults alike will enjoy this project of painting wooden blocks to turn them into the most adorable garden markers. You don’t even have to be a great artist to love painting and if you prefer, you could print off templates and just trace them onto your blocks before you paint. These are super easy and are such a fun project to do with the kids. You can get a bag or a box of plastic knives for about a dollar at the Dollar Store and have plenty to create a marker for all of your veggies or herbs. 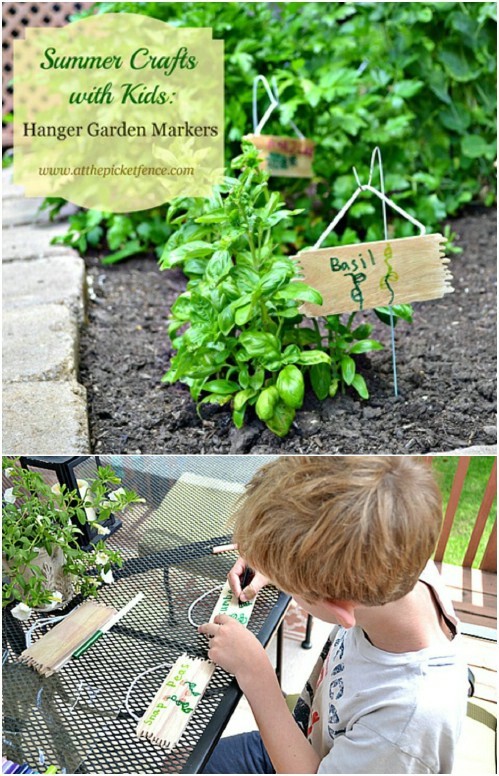 This is a wonderfully easy and super cheap DIY garden marker project and it’s even better because you don’t have to create stakes to put your markers in the ground. Once you have them finished, you just stick the knife end into the ground and you’re all done. 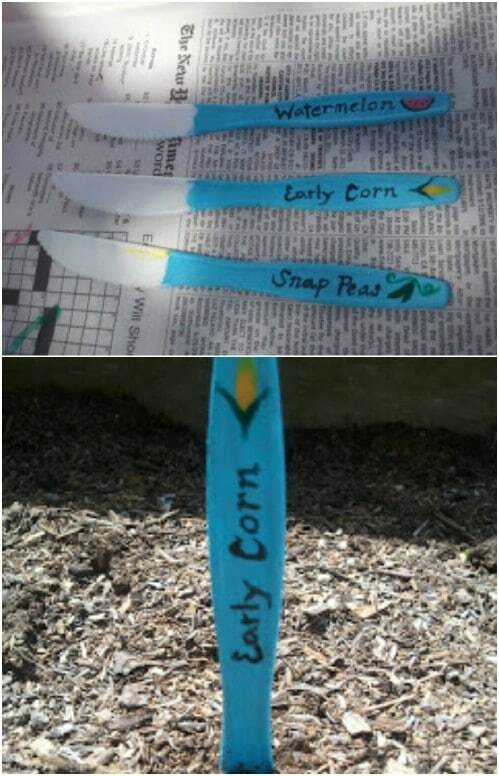 You can make the most adorable plant markers for your garden out of old plastic spoons. This is a great idea for post party cleanup. 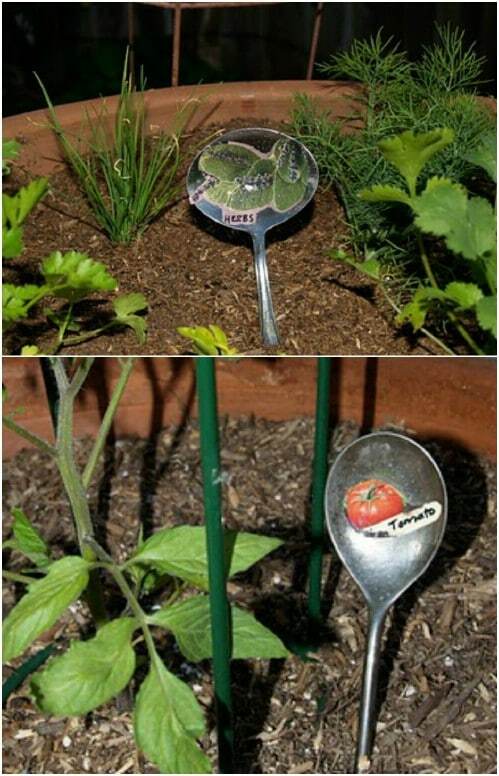 Just wash those used plastic spoons and recycle them into garden markers. Plus, kids are going to love helping with this one and it is a really simple and really inexpensive project. Even if you have to buy new plastic spoons, they’re only about a dollar per box at Dollar Tree. Do you have cats? Or dogs? If you do then you likely have had to replace at least one mini blind in your home. Cats and dogs love digging at the blinds to get to the window, tearing them up in the process. 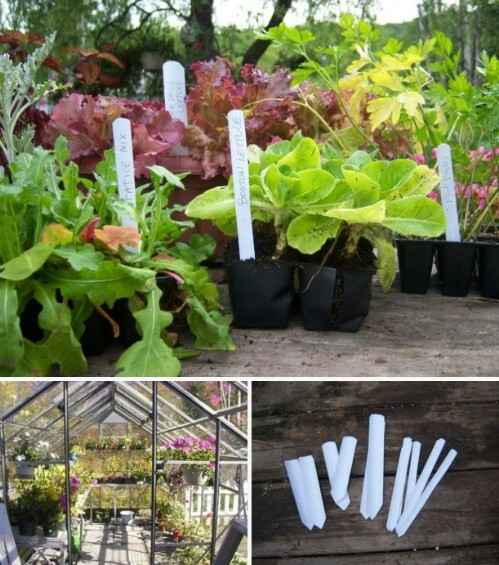 Instead of throwing out that mini blind, turn those broken pieces into plant markers for your garden. This is super easy and gives you a wonderful way to upcycle those broken mini blinds that you would otherwise just throw out. 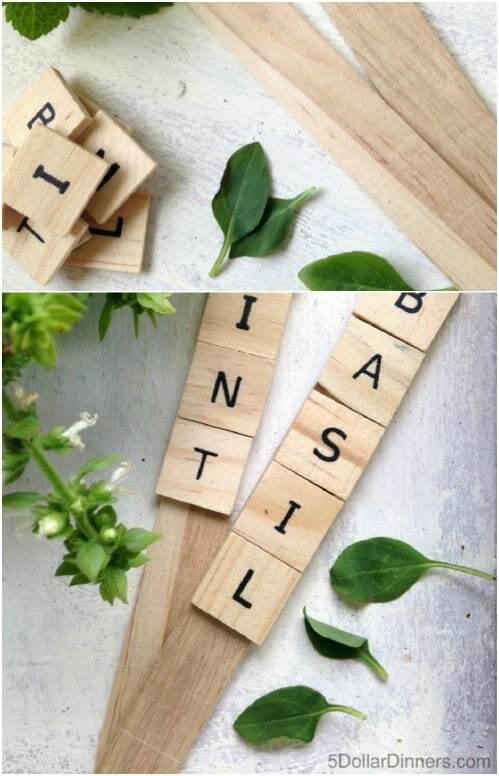 If you have an old Scrabble game that is missing some of its tiles, you can use those remaining ones to create the most adorable garden markers for your plants. There are some wonderful ways to upcycle old board games and this is one of them. If you don’t have an old Scrabble game to use, you can get a cheap knockoff version at the Dollar Store for just a couple of dollars. This is a wonderful way to repurpose old board games. 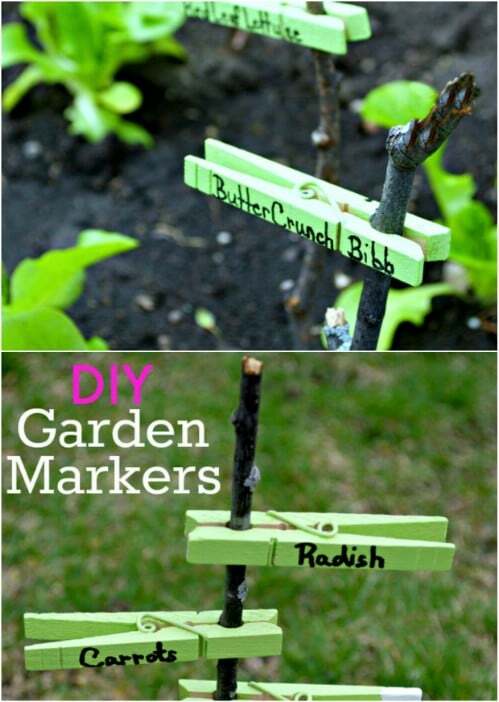 You don’t even have to spend money to get wonderful plant markers for your garden. You can go out into the yard and gather up some twigs and sticks to get the job done. This is a wonderful project and it just shows you that there are some wonderful stick and twig projects. You will need pruners to pull some of the bark off of your sticks and then the rest is really easy. I love finding new uses for old things. Take this upcycled glass bottle plant marker idea. This is so easy and it is a wonderful way to use up those old wine bottles or any other glass bottle that you may have on hand. There are so many wonderful ways to upcycle glass bottles! I love how simple this is and it really gives a unique look to your herb or vegetable garden. If you have a few old wire hangers on hand that you aren’t using in the closet, you can turn them into the most adorable little plant markers. You will need something for the actual marking, like scrap boards and they hang from the hangers. This is such a creative idea and really looks gorgeous. 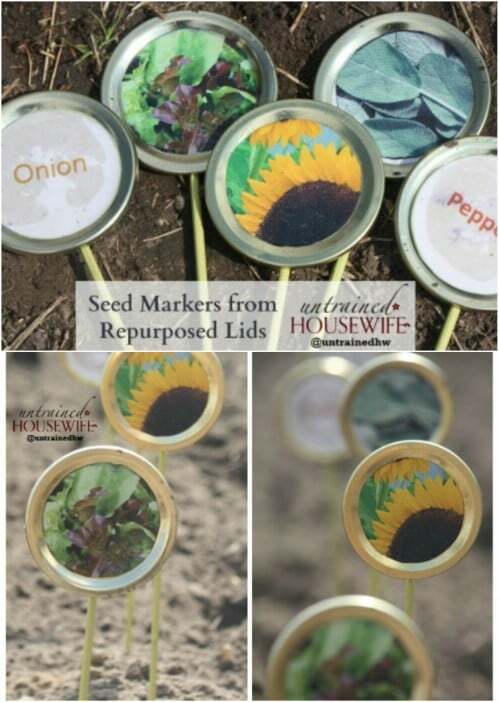 You could use these in your herb or veggie garden or use them to mark the flowers in your flower garden so that you know which ones are perennials and which ones are annuals. You can find so many amazing ways to repurpose old hangers! 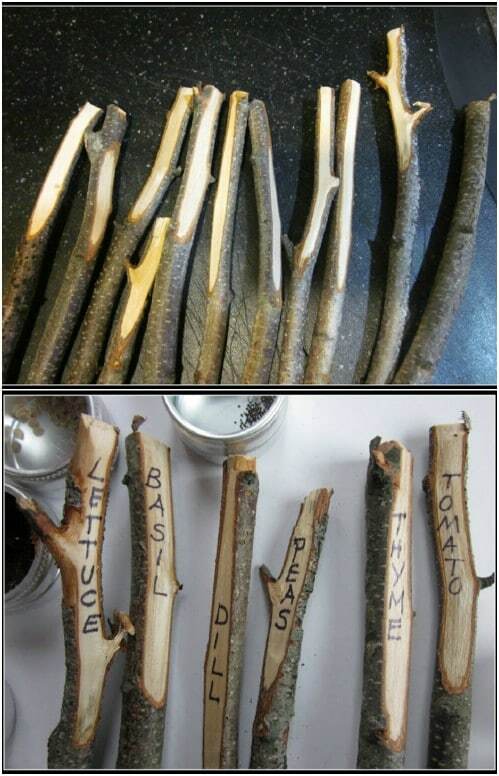 I love the idea of using wooden spoons as plant markers. 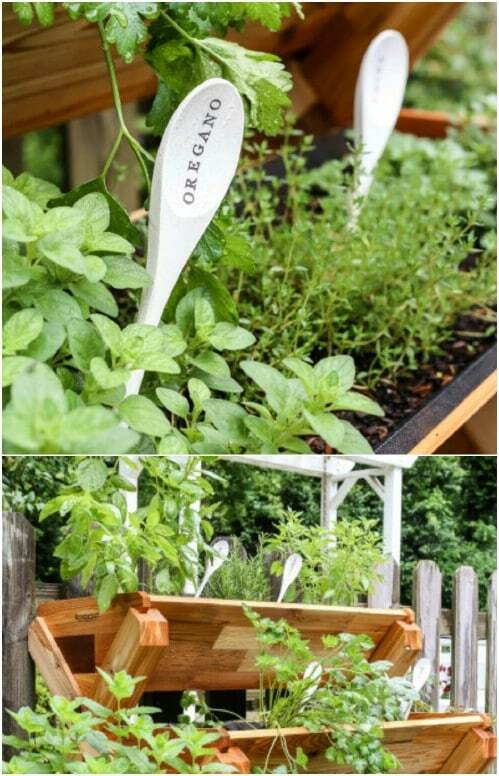 Not only is this a really easy…not to mention really cheap…method of marking your plants, the wooden spoons have such a nice rustic look to them. 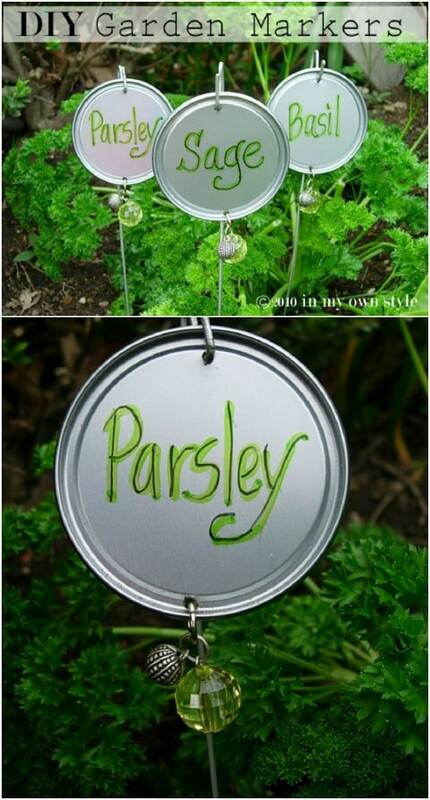 This is instant décor for your herb or veggie garden and these are super easy to make. If you don’t have a bunch of old wooden spoons that you can use, check thrift stores or you can buy them in bags of four or five for a dollar or so at the Dollar Store. Does anyone know how to get this website to quit leaving pop-ups on my screen every time I open my computer?